The floor stand projector screen is very compact and easy to transport. Legs folding inward significantly contribute to portability! It's rather difficult to obtain a perfectly smooth surface of the screen after rolling out. This is an excellent portable projector you can take for presentations, lectures, exhibitions or meetings with friends. 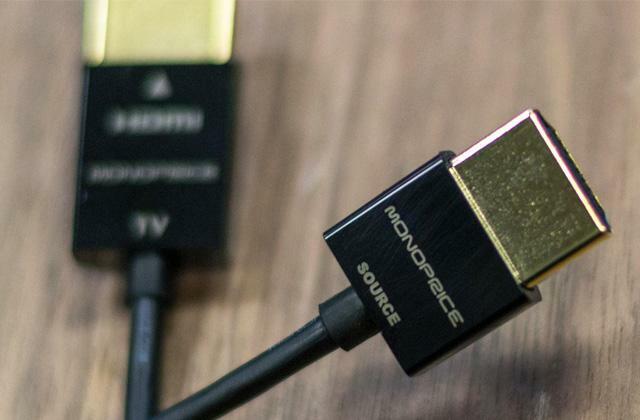 A perfect model for showing movies or video clips! 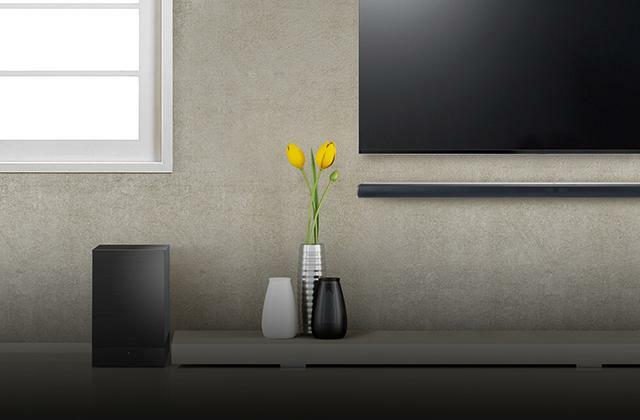 There are both wired and wireless remotes that significantly simplify screen usage. Due to the large size of the model, it's necessary to consider its placement beforehand. 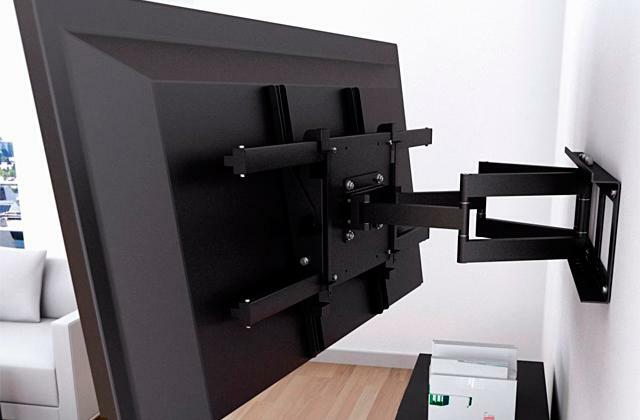 This motorised projector screen raises and lowers into a case within minutes. The perfect solution if you value optimal comfort! The shape of mounting holes allows fixing the screen on a wall as well on the ceiling. The locking mechanism does not always work at the first try. 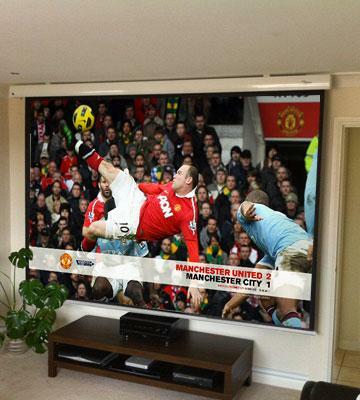 An excellent projector screen for personal use, especially for home cinema. 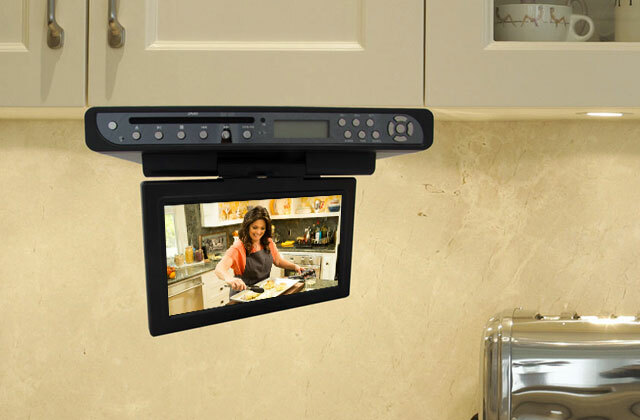 Thanks to a convenient tripod, you'll be able to place the screen in any part of a room in a suitable position. The screen doesn't quite fit large-format videos. 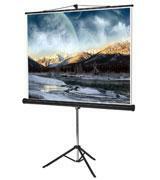 If you're planning to hold meetings and presentations, this projector screen is a great choice! With the gain factor of 1.0, this projector screen offers an extremely comfortable and clear viewing. Creases might appear after long usage. This is the easiest in use projector screen that supports all image formats and has a good gain for home use. It has never been so easy to carry a projector screen as in the case of Durosonic FPS100/43. 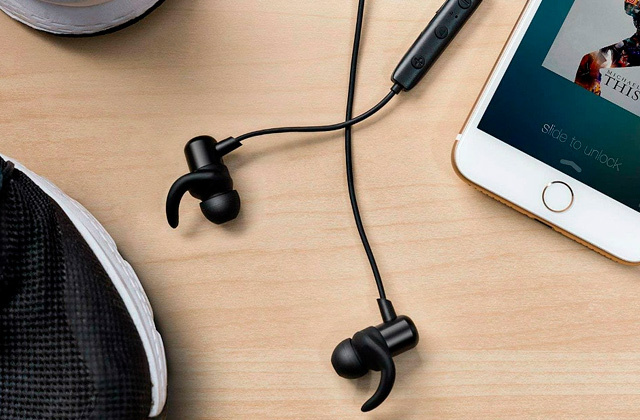 The screen quickly raises and lowers into a case on a roller, so, there is nothing to it to bring the screen to your friends' house or anywhere else. To facilitate transportation, the projector screen comes with a special carrying handle. Also, consider that the product weighs only 1.3 kg! The preparation for use is also a breeze as the construction doesn’t have to be mounted on a wall or ceiling and can be placed right on the floor. The metal case has two latches on the front face as well as two rotating stabilisation feet at the bottom of the case. Feet can be rotated outward while the projector is in use and hidden into the metal case during transportation. Additionally, we recommend you to look through our review on mobile projectors and choose the best one! The main advantage of this projector screen is that it's equipped with a mechanism of semi-automatic lowering. 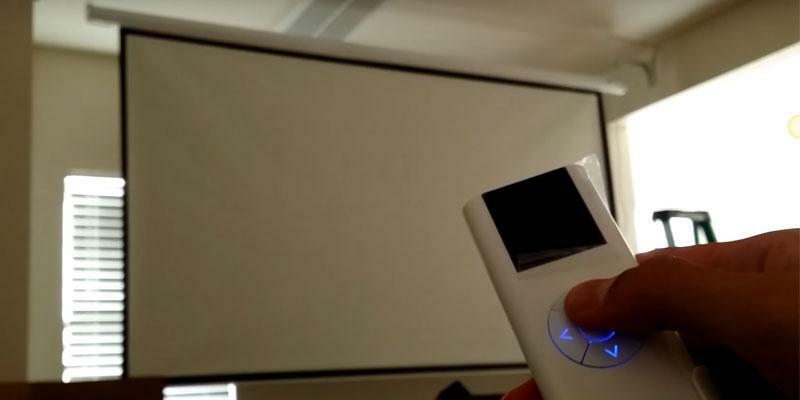 The mechanism can be controlled with a wired remote as well as a wireless one; both are supplied with the projector screen. The wired remote has three buttons, so you'll be able to raise the screen and lower it to a certain position. 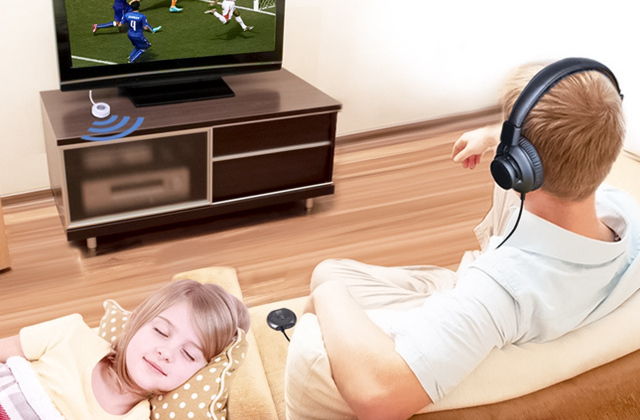 A wireless remote allows you to control the same functions, however, at a distance of up to 25 meters. It's also worth mentioning that you will clearly see the image on the screen as its diagonal equals 305 cm. Basically, this is a great model for home use! Now, all your friends and close relatives will definitely appreciate your photo collections or recorded videos. 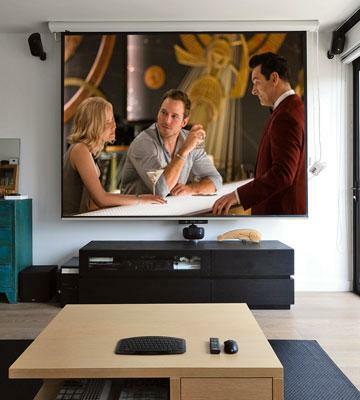 Have you already chosen the right home theatre projector to pair up with this screen? Such screen as VonHaus will be a superior choice for home use as well as for professional applications. 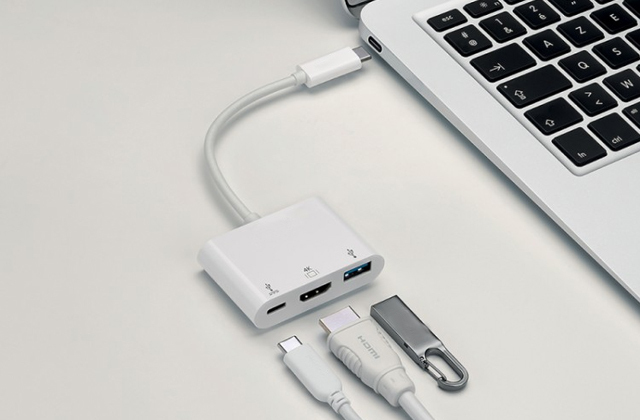 With this product, you'll be able to watch movies, video clips and carry out impressive presentations for a large audience. 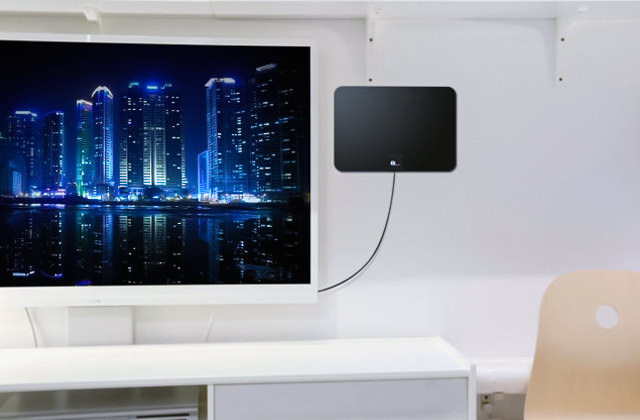 The screen can be mounted either on a wall or on a ceiling with screws or anchors. Mounting holes allow dismantling the construction effortlessly. 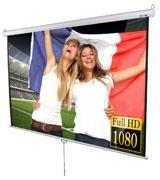 This retractable projector screen is completely manual, all you need to do is pull down a handle! Additionally, self-locking mechanism prevents the screen from rolling back up into the case. Black borders improve contrast ratio, so, you will definitely be excited with the image the screen provides! 16:9 aspect ratio will be an essential point for those who love high definition pictures. 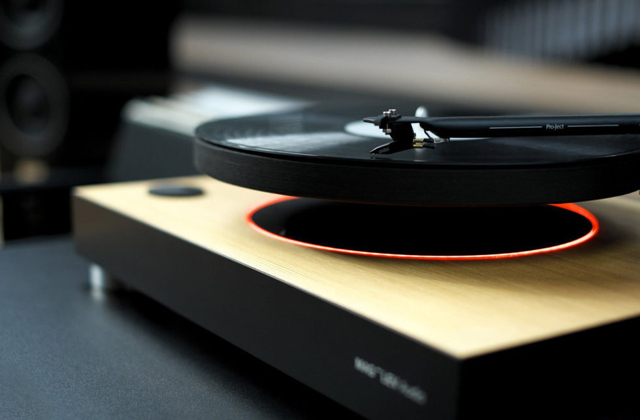 Additionally, if you value rich and crisp sound, you can take advantage of stereo receivers. A well-conducted presentation or meeting sometimes can determine the success or failure of a whole business. Therefore, it's reasonable to be equipped with a high-quality projector and a projector screen! Basically, this is an essential part for business presentations, product introductions, and corporate training! 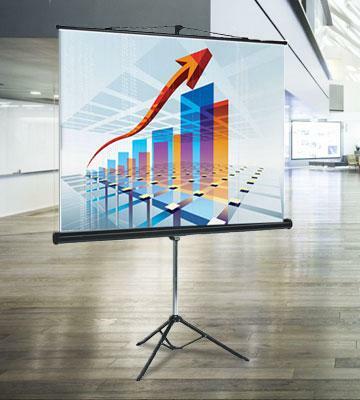 Let's look at Bi-Office Tripod Projection Screen! 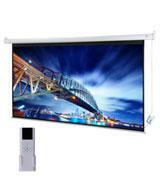 Despite its compact size ( 125 x 125 cm), the screen is more than suitable for slide shows. The screen itself has 1:1 aspect ratio, however, it allows you to choose the aspect ratio of 4:3 and 16:9 as well. 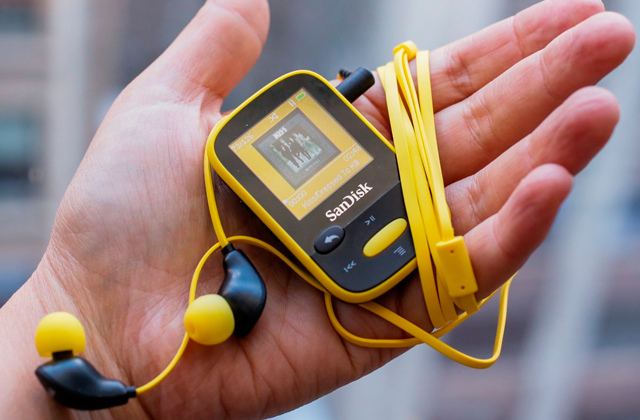 Due to a convenient tripod, you'll be able to install the screen wherever you want! Moreover, if you need to transport the projection screen, you'll have no problems with that! With a few simple moves, you'll be able to quickly assemble the construction. If you're looking for a convenient and efficient solution for conferences, presentations and lectures, take a peak at presentation remotes! 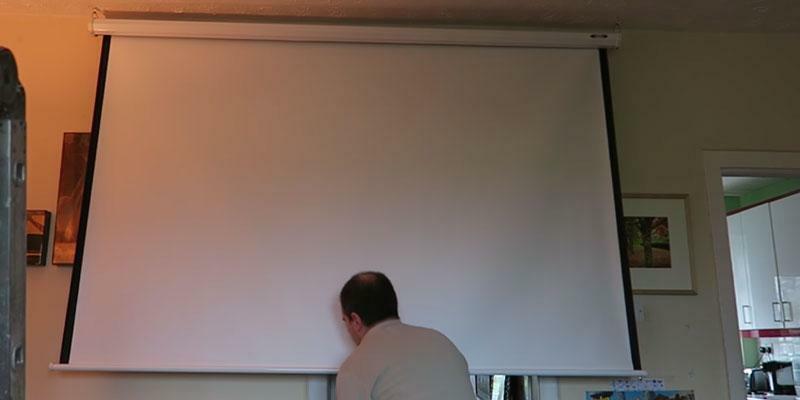 This projector screen is one of the simplest in use, the great choice for a home theatre! It'll be enough to fix it on a wall via screws or anchors and just pull down the handle. 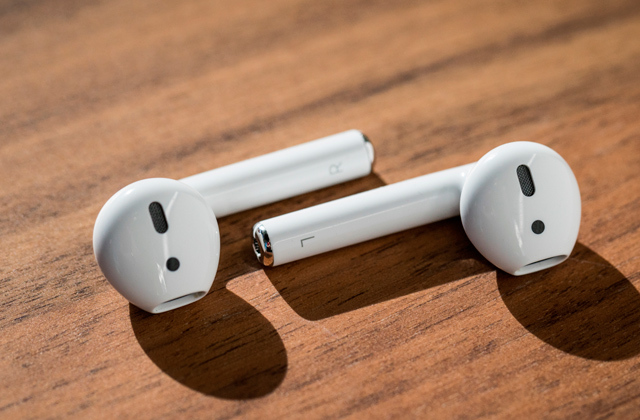 The special locking mechanism will keep the screen in a set position. The screen is three-layer combining dense fabric with vinyl covering. Matte white screen features a gain factor of 1.0, making the model ideal for home usage. Thanks to the diagonal screen size of 289 cm it will be suitable for the most popular screen formats such as 1:1, 4:3, 16:9 and others. Black stripes on sides increase the contrast of image ensuring greater comfort while watching a movie or a video clip. Besides, if you want to enjoy a high-quality image, pay attention to HD projectors! A projector screen is an essential item for making presentations or watching movies with a projector. 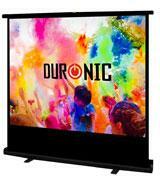 Today there is a wide variety of projector screens of different configurations and capabilities. 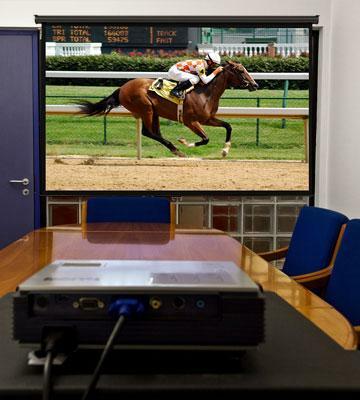 We present 5 best projector screens as well as their key characteristics. If you are also interested in projection equipment, we advise looking through home theatre projectors and mobile projectors. When you are looking for a projector screen, you should determine its type and design first. All projector screens may be divided into permanent and portable. You should know the place and conditions for the projector screen use. If you are going to use the screen in one place only, look for permanent models. But if you are going to move the screen during presentations in lecture rooms or offices, you should consider portable models. Note that projector screens have different design and size. The permanent models are generally retractable and must be mounted on walls or ceilings with screws or anchors. Besides, the permanent screens may be retracted manually or mechanically with electric motors. As for portable projector screens, the situation is much simpler. 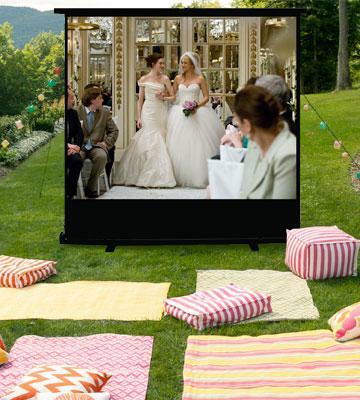 Portable screens feature adjustable stands or foldable frames of various shapes. The assembly and installation of portable screens can be done within 10 minutes. 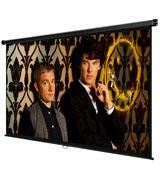 It is worth noting that inflatable projector screens are available on the market as well. The technical specifications of projector screens must be considered too as they are vital for image quality and comfort of watching. It is important to pick the screen of a needed diagonal to suit the place where it will be used. The screen diagonal can be chosen according to the following rule - the screen width should not exceed 1/2 of the distance to the first row and should be more than 1/6 of the distance to the last row. Note that the distance between the screen bottom and floor should be at least 50 inches. Once you determine the diagonal, proceed to the screen format. The aspect ratio should be chosen according to the videos you are going to watch. If you are looking for a screen to watch movies, you should pick 16:9 aspect ratio as it is common for most Hollywood films. If you need a screen for presentations, it’s better to choose 4:3 aspect ratio. The universal 1:1 aspect ratio also exists and allows projecting the image in either horizontal or vertical orientation. The viewing angle is also worth your attention. The top screens may have angles up to 180°. The wider is the angle, the less is the image distortion. The gain is one more important parameter that characterises the ratio of brightness to the light reflection. 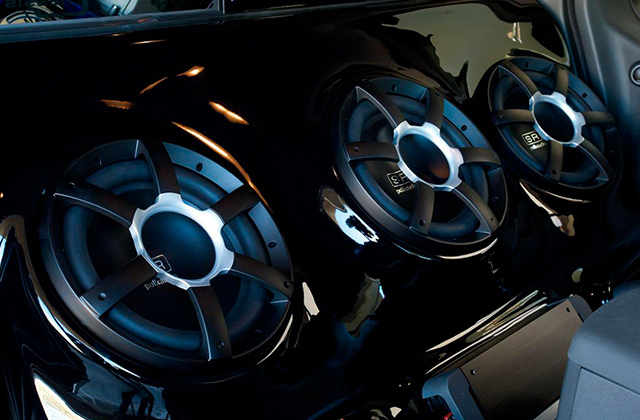 You should also pay attention to the screen material and coating. The screens generally have matte and glossy coatings. The matte coatings are suitable for outdoor use and rooms with different lighting. This screen yields no glares, and the image is seen well at different angles. Keep in mind that projector must yield sufficient brightness for a matte screen, otherwise, the image will be dull. As for the glossy screens, they provide rich and contrast image. However, it should be noted that such a screen may glare and is more appropriate for use as a home theatre in dark rooms. The projector screens are commonly made of textile fabric or vinyl that is easy to clean. Lastly, we would like to examine the extra features. A lot of projector screens boasts black edging called Extra Drop. The black edging absorbs the sunlight and prevents its reflection. 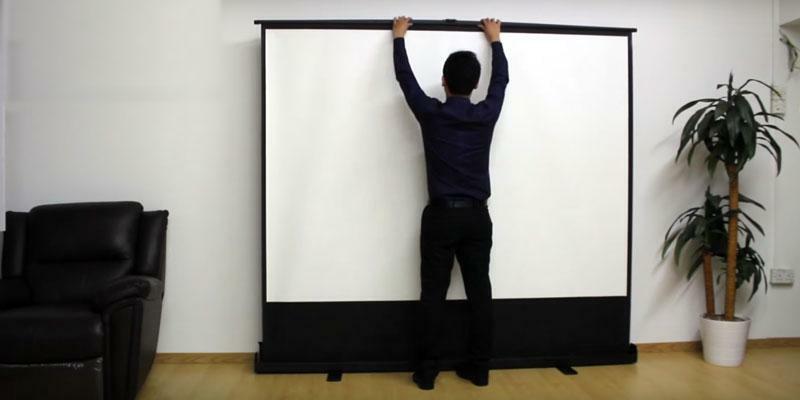 Some fixed projector screens can be equipped with motors that pull them up and down automatically via remote controls. The frames of portable screens may be used as hangers as they often have hooks. Many projector screens come with bags for comfortable transportation. Also, a lot of models feature special handles that allow for quick rolling-up. Some portable screens may have foldable tripods with automatic locks for quick adjustment of height. The permanent projector screens may feature special black backing to prevent the light penetration and improve the image quality. The last but not the least, inflatable projector screens are generally fitted with fans to facilitate installation. 1. 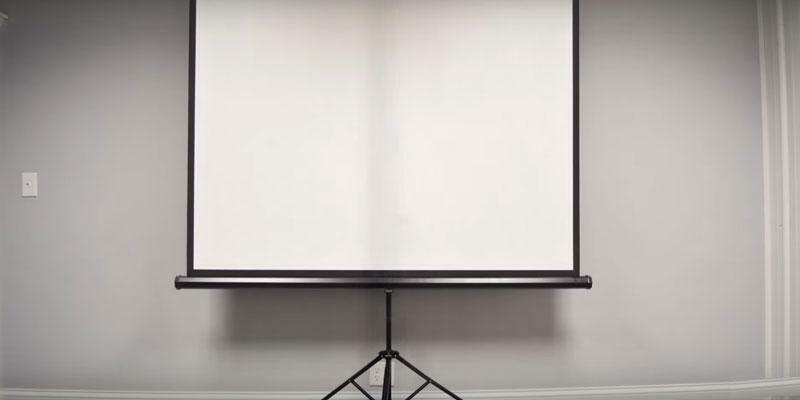 John Sciacca When a bedsheet won’t do: The ultimate guide to projector screens, Digital Trends. June 21, 2013. 2. 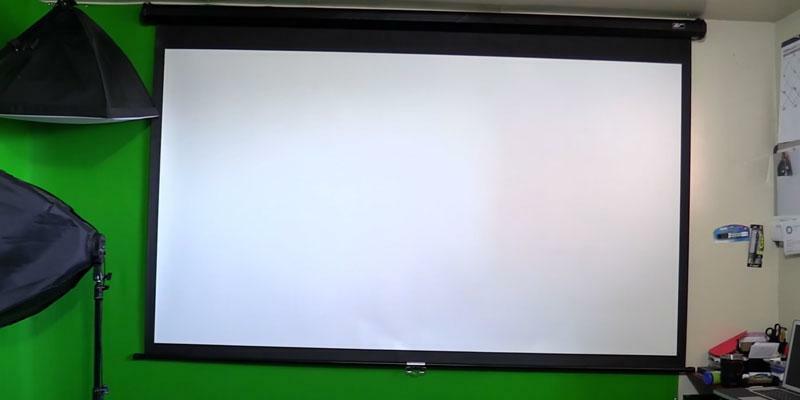 Michael Antonoff Projection Screens Buying Guide, B&H Photo Video. 3. Lisa Feierman How Do I Choose the Right Screen for My Projector? Projector Reviews. January 27, 2015. 5. Your Guide to Understanding Screen Gain, eBay. March 10, 2016.